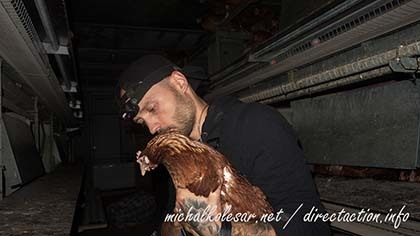 "We rescued 12 hens. They will not die in a cage or a slaughterhouse. We took them to kind people to their new homes. Now they can spread their wings and run free. They have sun insted of artificial light. Fresh air instead of a fan. Weaker ones can hide from the stronger ones. In January 2018, Sven was sentenced to five years in prison because of his part in the campaign against Huntingdon Life Sciences."